Captions: 1. 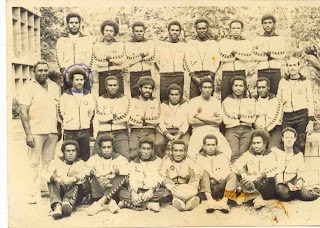 The 1979 PNG Pukpuks rugby union team in Suva, Fiji, with Badi Seyawa (second from left, front row). 2. Badi Seyawa (white beard) surrounded by his seven children and nine grandchildren. Picture by AURI EVA. 3. Waliya’s Badi Seyawa does his famous ‘flying tackle’ on University’s Arnold Amet. The opening lyrics of that great song by Bruce Springsteen, Glory Days, came immediately to my mind as I sat down and enjoyed a beer with long-serving Telikom employee and former PNG Pukpuks rugby union legend Badi Seyawa at the Paddys Bar. Seyawa, 59, from Saweda village in Balimo, Western province, leaves Telikom next month after a distinguished 42 years of service to the organisation – from an age of telegraphs to the internet, from the glorious colonial era to what is now a ramshackle Papua New Guinea. something that he is somewhat bitter about. Those memories of another day, including the loss of his beloved wife Renagi last August, came back as we downed our beers. “Waliya was ‘the’ team then,” Seyawa reminisces. “Waliya was the team to beat. “I was captain/coach and I did some magic things for Waliya. “We were premiers in 1973, 1974 and 1975. Seyawa, in fact, represented Papua New Guinea at the 1979 South Pacific Games with other great names like Kainantu’s Barevo Amevo, Milne Bay’s Sab Doiwa, Western Highlands’ Philip Num, and fellow Western province ‘barramundis’ Kolesi Mili, Tagala Nago, Wagubi Pilisa and Toby Warapa. 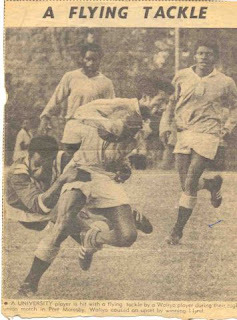 In his photo album is a newspaper cutting of him making a flying tackle on University’s Arnold Amet, team manager of the 1979 SP Games, and who was fated to one day become Chief Justice of PNG and Governor of Madang. “University beaten in rugby union” screamed the Post-Courier headline of that story by renowned sportswriter Graeme Boyd. “Last year’s unbeatables University had their colours lowered for the first time in 14 months when they met Waliya in the Port Moresby pre-season rugby union competition on Saturday,” wrote Boyd. “Waliya ran out winners 16-10. The Balimo warrior has come a long way since he started school at the Evangelical Field Mission in 1955. “I completed grade 4 there and then I was selected to government school at Balimo Primary School,” he recalls. “From Grade 5, I was selected for Grade 6 with my brother. “Four of us were selected to go to Daru Post-Primary School in 1962. “Out of the four of us, I was selected to go to Kerema Junior High School. “I spent three years there and graduated in 1965, with Sir Mekere Morauta being my senior at that time. “I was selected to come to Sogeri Senior High in 1966. “As soon as I completed Form 4 in 1966, Post & Telegraphs got me. “I was on holidays when they sent me a letter, and I joined them on March 22, 1967. “I grew up with a Christian family and I wouldn’t have achieved all this without a Christian upbringing. Seyawa started off very humbly in those far-off days. “I started off as a clerical assistant,” he tells me. “I started off at the post office in downtown Port Moresby. “That’s where the P & T head office was. “My job was to bill the customers who were using our system. “P& T was under the Australian government. “In 1970 and ’71, I was selected to go down to Sydney for the Commonwealth practical scheme. “There were two of us from P & T selected to do this training for six months in Sydney. “I was attached to the Post Master General’s billing office in Sydney. “After I came back, I was given the responsibility of looking after telephone accounts. “I was in that job for about two years. “After the two years, I was given another position as administrative officer, which was basically recruitment, training, and everything human resource. The technological changes which have taken place over the last 42 years, including the growth of Port Moresby and PNG, have been phenomenal for Seyawa. “Technologically, there have been very big changes over the years,” he says. “Whatever has taken place from when I started up to now is hard to describe. “My life within the Telikom organisation has been like a family, which I grew up in. “The changes have been remarkable. “My simple advice to our young people is to be committed, dedicated, honest and respect your superiors. “That’s what I did and all my friends have all the respect for me. Badi Seyawa officially finishes from Telikom on March 14, 2009, exactly 42 years after he started with the then P & T.
The loss of Renagi, from Gagagaba village outside Port Moresby, his beloved partner of many years last August, brings tears to his eyes as he brushes his white beard. “I’ve got a lot of plans for my kids,” Seyawa says. “I’ve got seven kids and nine bubus (grandchildren).